The wind is transporting pollen from male to female dog's mercury. 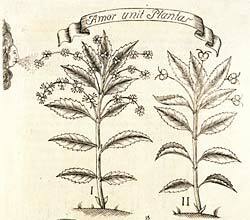 Picture from Linnaeus book ”Blomstrens biläger” from 1750. Different plant species have different methods to have their pollen transferred from flower to flower. The shape, colour and size of the flowers tell about the way they are pollinated. Plants with colourful petals or a strong scent are often pollinated by animals. They can for example attract bees, butterflies, beetles, birds or bats. Small inconspicuous flowers spread their pollen by the wind or are self-pollinated. To attract insects or other animals the plants offer a reward such as nectar or pollen. There is often a mutual dependency between plant and pollinator. Some plant species can be completely depending on one or a few insect species for their pollination, for example the ”star of Bethlehem”. In the same way an insect can be completely depending on one plant species for its survival. In this interaction among species there are some dishonest plants that take advantage of the situation. They pretend to be one of the rewarding plants but do not give a reward. Many orchids, for example fly orchid, are fooling their pollinators.